FCPO 3rd month Oct futures contract traded RM4 lower to close at RM2673 levels as compare to previous trading sessions with a total of 10,891 lots traded in the market. FCPO price manage to recover partial losses from previous 2 – day sell rally as crude oil and soybean oil were traded lower during electronic trading sessions. 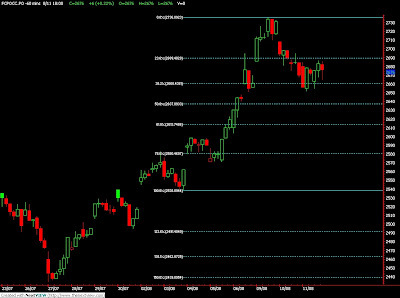 FCPO price manage to rebound towards RM2704 regions; 61.8% Fibonacci resistance levels, before to settle at RM2673; 61.8% Fibonacci support levels, in hourly trading price chart. 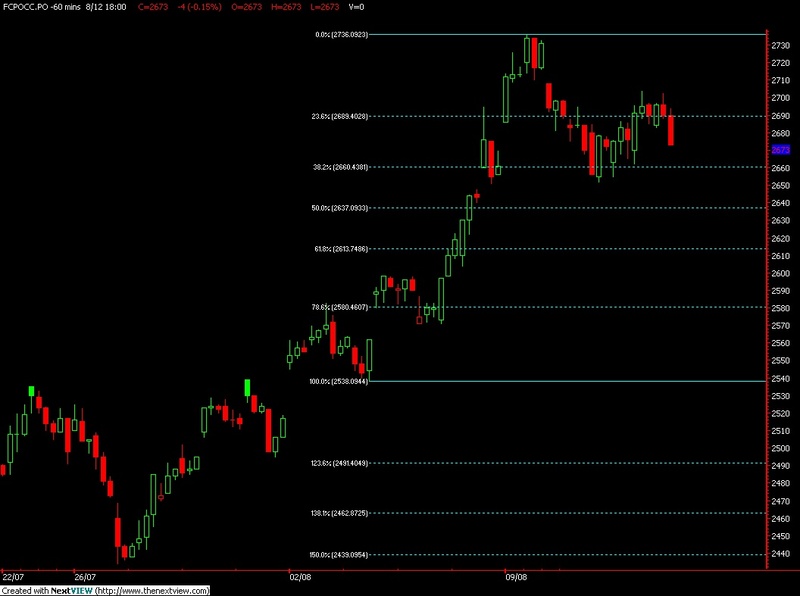 Technically, FCPO price seems temporary topped around RM2704 resistance levels in attempt to test further support levels at RM2637 and RM2614; both are 50% and 61.8% Fibonacci support levels, for correction phase count. However, FCPO price must not trade above resistance levels at RM2704 and RM2736 in order for correction phase to remain intact. FKLI Aug Futures contract traded 1.5 points lower to close at 1346.0 levels as compare to previous trading session to with a total of 7,734 lots traded in the market. FKLI opened lower for trading but manage to recover from losses soon as most of the regional indices were recovered during the 2nd trading sessions despite Dow Jones Futures electronic was still trading below green during trading sessions. 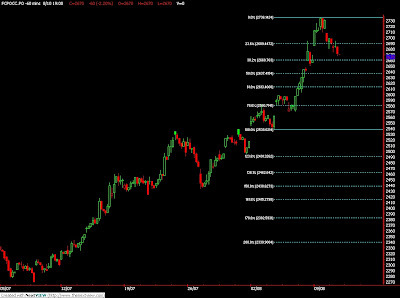 FKLI price was well holding above support levels at 1347.5; 278,6% Fibonacci support levels, before manage to rebound towards resistance levels at 1349 regions; 38.2% Fibonacci resistance level. 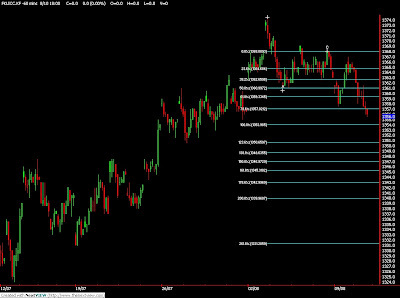 Technically, FKLI price seems trading on minor wave 3 trading south provided resistance levels at 1356 and 1367 were not violated in the coming trading sessions. However, it’s essential for FKLI price to trade below support levels at 1342 and 1339 in order to further affirm on south trading direction. Crude oil rebounded from a one-month low and traded above $76 a barrel in New York after falling as U.S. applications for unemployment benefits rose. Oil, which has declined 5.7 percent this week, rose for the first time in four days. Futures fell the most in six weeks yesterday as initial jobless claims rose by 2,000 to 484,000 last week, the highest level since February. Crude oil for September delivery gained as much as 39 cents, or 0.5 percent, to $76.13 a barrel and was at $76.08 in electronic trading on the New York Mercantile Exchange at 9:19 a.m. Sydney time. Yesterday, the contract fell $2.28 to $75.74, the lowest settlement since July 12. Futures are up 8 percent from a year ago. Brent crude oil for September settlement fell $2.12, or 2.7 percent, to end the session at $75.52 a barrel on the London- based ICE Futures Europe Exchange yesterday. It was the lowest close since July 21. FCPO 3rd month Oct futures contract traded RM6 higher to close at RM2676 levels as compare to previous trading sessions with a total of 7,932 lots traded in the market. FCPO price manage to recover from losing ground after opened and traded lower during early trading sessions due to weak soybean oil and crude oil electronic trading during the trading sessions. FKLI Aug Futures contract traded 8.5 points lower to close at 1347.5 levels as compare to previous trading session to with a total of 6,237 lots traded in the market. FKLI opened lower for trading and continue trading lower during trading sessions as most of the regional indices were plunge lower with Nikkei index plunge more than 2%, Shanghai Index plunge 1.5% as the major leading indices. 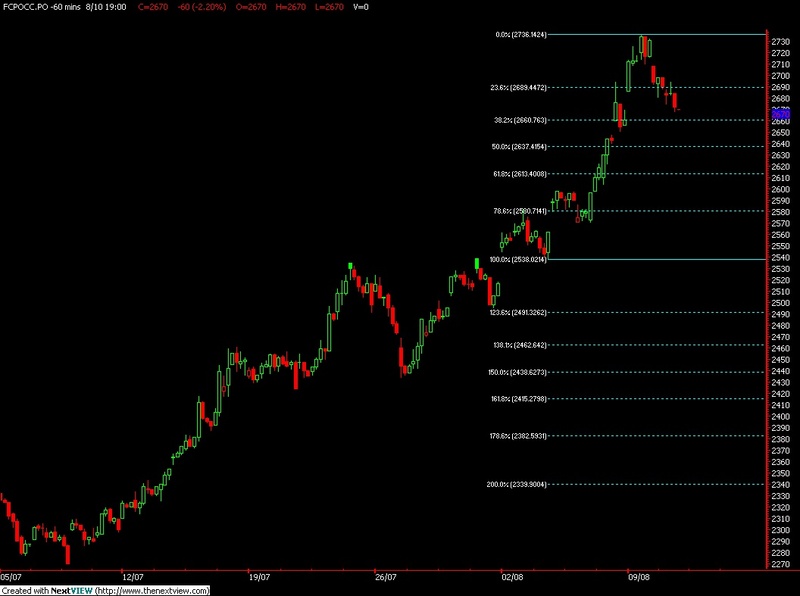 FKLI plunge lower after long consolidation around 1351 to 1355 regions before trading lower towards next support levels at 1345 regions; 61.8% Fibonacci support levels. 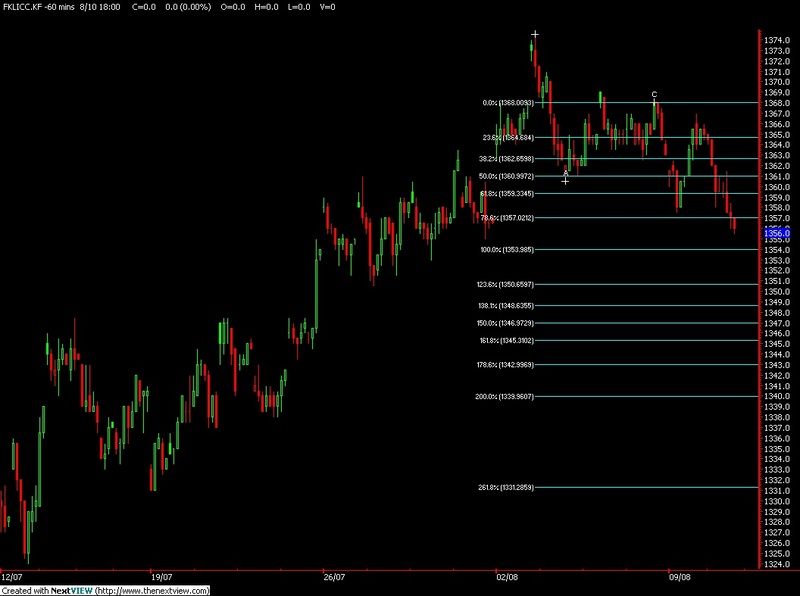 Technically, FKLI seems encounter some buying interest around support levels at 1345 and 1337 regions. 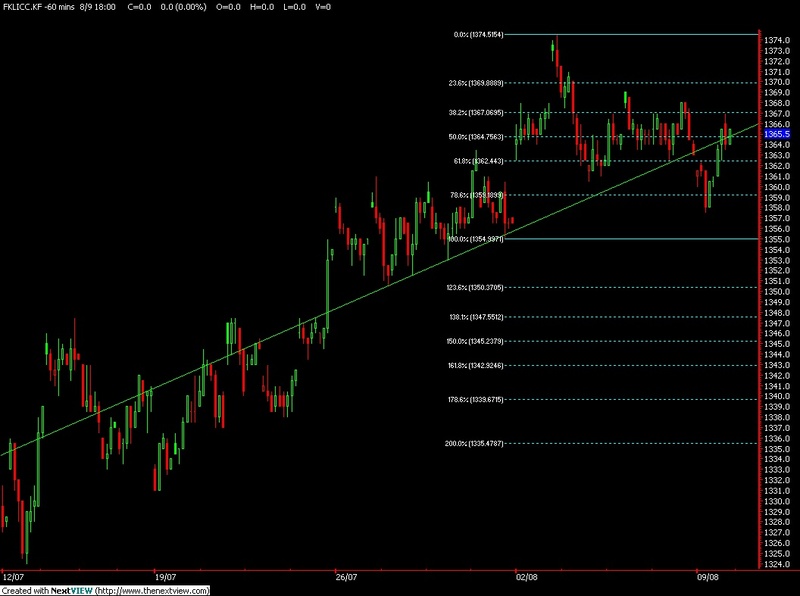 FKLI would trigger further selling activities once support levels seem fails to hold trading price above support levels. 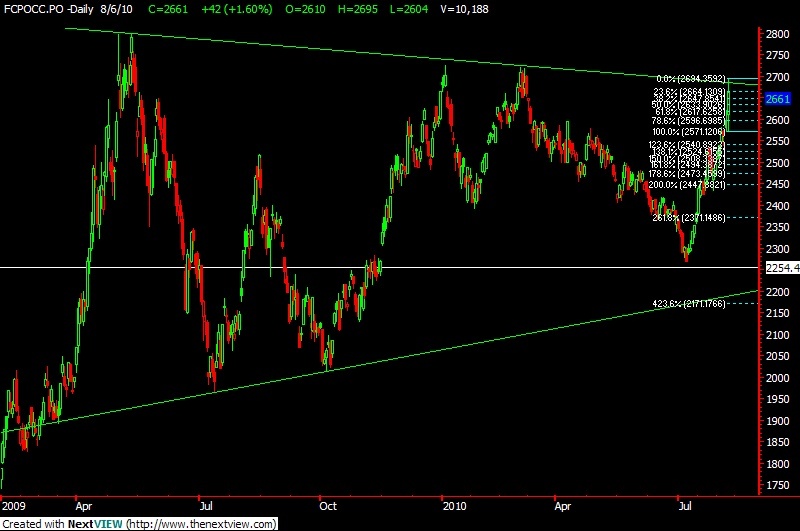 On the contrary, FKLI trading price would encounter some degree of resistance around 1354 and 1362 regions. Crude oil was little changed near a seven-day low after the Labor Department reported the productivity of U.S. workers fell in the second quarter, a sign the economy is struggling to recover. Oil dropped 1.5 percent yesterday as the department said the U.S. lost momentum heading into the second year of the recovery from the recession. Crude pared its losses after Federal Reserve policy makers announced their first attempt to bolster growth since March 2009. Gasoline supplies rose last week, according to the American Petroleum Institute. Crude oil for September delivery traded at $80.37 a barrel, up 12 cents, in electronic trading on the New York Mercantile Exchange at 9:18 Sydney time. Yesterday, the contract fell $1.23 to $80.25, the lowest price since July 30. Futures have climbed 16 percent in the past year. The Labor Department’s measure of employee output per hour decreased at a 0.9 percent annual rate, the first drop since the end of 2008. The median forecast of economists surveyed by Bloomberg News projected a 0.1 percent gain. The Fed decided to maintain its holdings of securities to prevent money from being drained out of the financial system and to keep the slowing U.S. economy from relapsing into recession. The central bank said it will reinvest principal payments on its mortgage holdings into long-term Treasury securities. The Energy Department increased its crude-oil price forecast for 2010 to an average $79.13 a barrel from $78.69 in July, according to its monthly Short-Term Energy Outlook, released yesterday. The department raised its estimate for global oil consumption this year to 85.91 million barrels a day from 85.82 million last month. A weather system in the southeastern Gulf of Mexico has a 70 percent chance of becoming a tropical storm in the next 48 hours, according to a U.S. National Hurricane Center forecast at 2 p.m. Miami time. U.S. crude oil supplies declined 2.8 million barrels last week, the American Petroleum Institute said. An Energy Department report today may show that inventories dropped by 2 million barrels, according to a Bloomberg News survey. Gasoline stockpiles increased 729,000 barrels last week, the Petroleum Institute said. The Energy Department report may show inventories rose 250,000 barrels from 223 million, the Bloomberg News survey shows. Brent crude oil for September settlement fell $1.39, or 1.7 percent, to $79.60 a barrel on the London-based ICE Futures Europe Exchange yesterday. FCPO 3rd month Oct futures contract traded RM60 lower to close at RM2670 levels as compare to previous trading sessions with a total of 11,009 lots traded in the market. FCPO price plunge lower during trading sessions as soybean oil and crude oil were traded lower during electronic trading while unfavorable ITS and SGS export figure were released during morning and afternoon trading sessions. FCPO price penetrate previous support levels at RM2710 when open for trading at RM2708 and continue to plunge lower in attempt to test support levels at RM2690 and RM2660; both are 23.6% and 38.2%, in the hourly price chart. 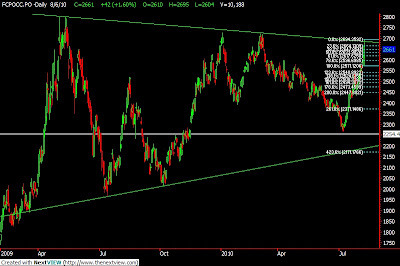 Technically, FCPO price seems more towards downside where next nearest support seen at RM2660 and RM2644 while crucial support levels seen at RM2538 regions. 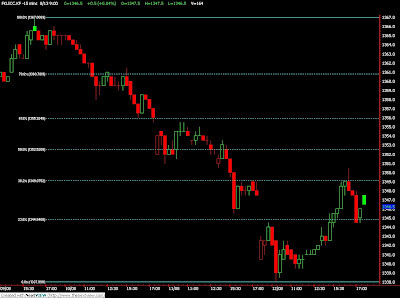 Failure to hold trading price above support levels shall trigger further selling pressure into the market. 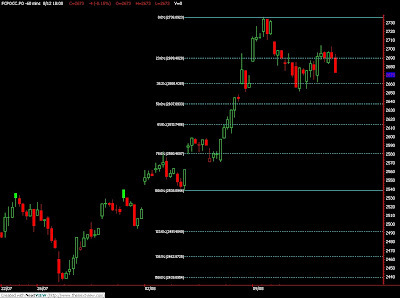 Resistances levels were seen at RM2695 and RM2736 regions. FKLI Aug Futures contract traded 9.5 points lower to close at 1356.0 levels as compare to previous trading session to with a total of 3,431 lots traded in the market. FKLI opened unchanged and continue to trade lower during trading sessions as regional indices especially Shanghai Index plunge more than 2% upon end of trading sessions while Dow Jones Futures electronic trading was traded lower during the trading hours. FKLI plunge lower during trading sessions after attempt to penetrate resistance levels at 1367 failed while previous support levels at 1361 seems fails to hold against selling pressure. Technically, FKLI seems trading south in the coming trading sessions provided support levels at 1355 and 13505 fails to hold firm against the selling activities. However, FKLI would be affirming bullish sentiment back into rally once resistance levels at 1367 and 1379 were violated in the coming trading sessions. Crude oil was little changed above $81 a barrel in New York after rising for the first time in four days as advancing equity markets buoyed confidence that the economic rebound will spur fuel demand. Oil rose 1 percent yesterday as the MSCI World Index of equities in 24 developed nations climbed to a 12-week high amid speculation slower U.S. jobs growth will prompt the Federal Reserve to extend efforts to strengthen the economy. U.S. crude stockpiles probably declined last week, according to a Bloomberg News survey before an Energy Department report tomorrow. Crude oil for September delivery was at $81.49 a barrel, up 1 cent, in electronic trading on the New York Mercantile Exchange at 10:59 a.m. Sydney time. Yesterday, the contract rose 78 cents to settle at $81.48. Futures have climbed 16 percent in the past year. The MSCI index advanced 0.5 percent in New York, the Standard & Poor’s 500 Index gained 0.6 percent and the Dow Jones Industrial Average increased 0.4 percent. The Federal Open Market Committee meets today. A report that U.S. companies hired fewer workers than forecast last month intensified a debate among economists over whether Fed policy makers will take an incremental step toward providing more stimulus. Crude stockpiles in the U.S. probably declined 2 million barrels last week, according to the Bloomberg survey. Refineries probably ran at 90.7 percent, down 0.5 percentage point from the prior week, the survey showed. Global refining margins, or the profit from turning crude oil into fuels such as gasoline and diesel, averaged $4.58 a barrel from July 1 to Aug. 5, down 17 percent from a second- quarter average of $5.49 a barrel, according to data published yesterday by BP Plc. The margin along the U.S. Gulf Coast, home to 43 percent of the country’s refining capacity, was $4.84 a barrel, down 27 percent from the second-quarter average, according to BP’s Global Indicator Margin. Lower refinery margins reduce the incentive to buy and process oil into gasoline and other fuels. Brent crude oil for September settlement traded at $81.05 a barrel, up 6 cents, on the London-based ICE Futures Europe exchange at 11:03 a.m. Sydney time. Yesterday, the contract rose 83 cents, or 1 percent, to settle at $80.99. Cash premiums for soybeans shipped to export terminals near New Orleans declined relative to Chicago futures as farmers increased sales after prices rallied for a ninth straight session. Corn premiums were unchanged. The spot-basis bid, or premium, for soybeans delivered in August dropped to 80 cents to 94 cents a bushel above November futures on the Chicago Board of Trade from 92 cents to $1 on Aug. 6, U.S. Department of Agriculture data show. Corn premiums for delivery this month were 25 cents to 30 cents above September futures. “The cash soybean market is weaker because farmers are moving more of last year’s crop,” said Dax Wedemeyer, an analyst at U.S. Commodities Inc. in West Des Moines, Iowa. Soybean futures for November delivery rose 1.5 cents, or 0.1 percent, to close at $10.35 a bushel at 1:15 p.m. on the Chicago Board of Trade. Prices gained for the ninth straight session, the longest rally since September 2007. Corn futures for September delivery fell 2 cents, or 0.5 percent, to $4.03 a bushel. 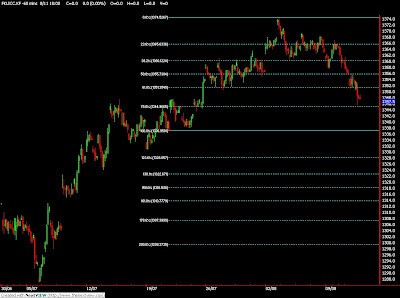 On Aug. 5, the price reached $4.2525, the highest level for the contract since Jan. 12. Government inspectors examined 7.13 million bushels of soybeans for export in the week ended Aug. 5, down 40 percent from a year earlier, the USDA said today in a report. Corn inspections rose 17 percent. FCPO 3rd month Oct futures contract traded RM70 higher to close at RM2731 levels as compare to previous trading sessions with a total of 14,200 lots traded in the market. FCPO price open higher for trading and continue traded higher during trading sessions as soybean oil and crude oil electronic trading were traded higher during electronic trading sessions. 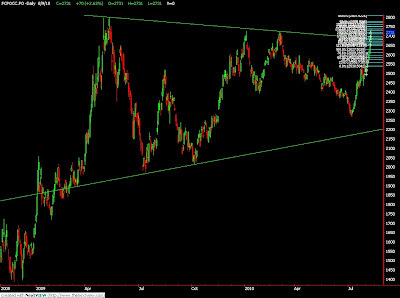 FCPO price penetrate daily resistance trend line at RM2680 regions and continue to search higher resistance regions before settle at RM2731 by the end of trading sessions. Technically, FCPO price expected to trade higher on bullish sentiment provided support levels at RM2700 and RM2668; both are 23.6% and 38.2% Fibonacci support levels, were not violated in the coming trading sessions. However, FCPO price would expect to encounter some selling pressure around resistance levels at RM2747 and RM2807 regions; 78.6% and 100% Fibonacci resistance levels. FKLI Aug Futures contract traded 2.5 points higher to close at 1365.5 levels as compare to previous trading session to with a total of 3,962 lots traded in the market. FKLI opened lower upon open for trading sessions as Nikkei index was traded lower but FKLI soon manage to recover from losses as Hang Seng index and other regional indices manage to recover during trading sessions. 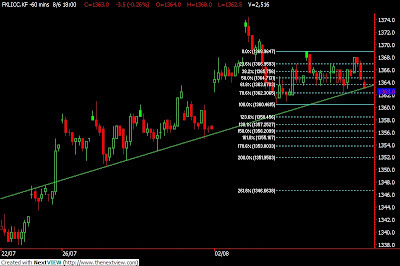 FKLI succeed in attempt to penetrate hourly support trend line seen at 1363 regions while attempt manage to search support at 1358 regions; 78.6% Fibonacci support levels at 1379 regions. 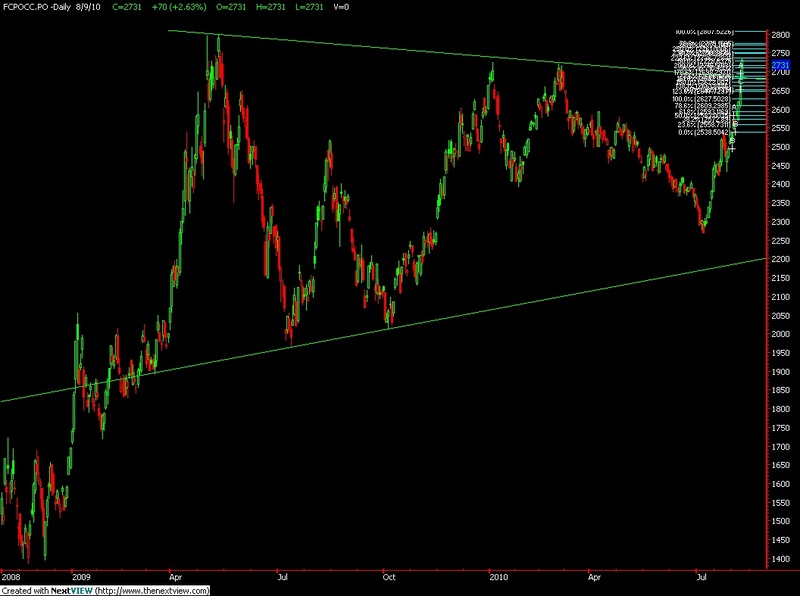 Technically, FKLI would trigger further sells activities if traded price fails to penetrate resistance levels at 1369 and 1379 regions. However, FKLI would only be further affirming on bearish sentiment provided support levels at 1355 and 1350.5 fails to hold against the selling pressure. Crude rose for the first time in four days amid optimism fuel demand will increase because of improved prospects for an economic recovery in the U.S., the world’s biggest oil-consuming country. Oil advanced as economists surveyed by Bloomberg News forecast U.S. retail sales probably climbed in July for the first time in three months as incentives spurred auto purchases. The 0.5 percent estimated gain followed a 0.5 percent decline in June. An Energy Department report Aug. 4 showed U.S. crude stockpiles fell 2.8 million barrels to 357.9 million. “The demand outlook is improving, albeit slowly,” said Ben Westmore, a minerals and energy economist at National Australia Bank Ltd. in Melbourne. “Where we are at the moment at $80 a barrel is probably where we should be, based on fundamentals,” he said. Crude oil for September delivery rose as much as 25 cents, or 0.3 percent, to $80.95 a barrel in electronic trading on the New York Mercantile Exchange. It was at $80.85 at 9:40 a.m. Sydney time. 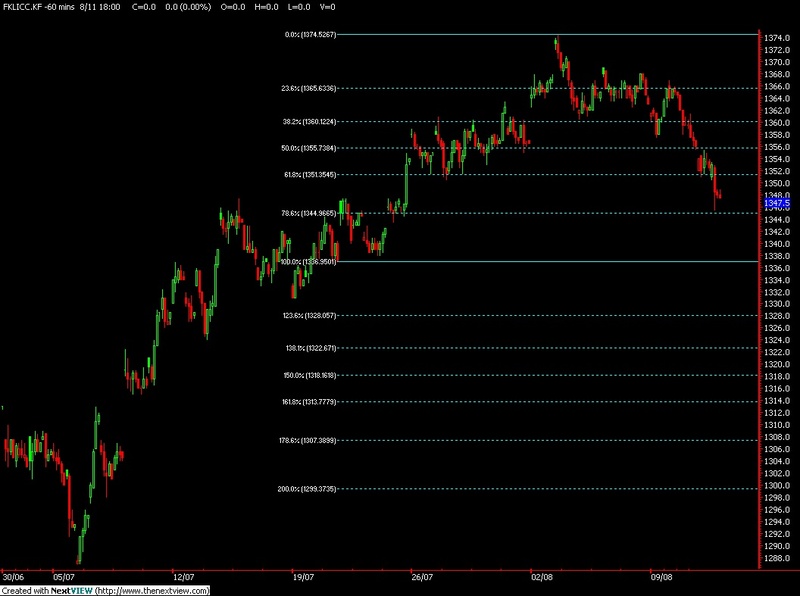 The contract fell $1.31, or 1.6 percent, to $80.70 on Aug. 6. Futures are 15 percent higher than a year ago. Oil declined on Aug. 6 after the U.S. Labor Department said private payrolls that exclude government agencies rose by 71,000, less than forecast, after a gain of 31,000 in June that was smaller than previously reported. Brent crude oil for September settlement rose as much as 33 cents, or 0.4 percent, to $80.49 a barrel on the London-based ICE Futures Europe exchange. It was at $80.30 at 8:17 a.m. Sydney time. 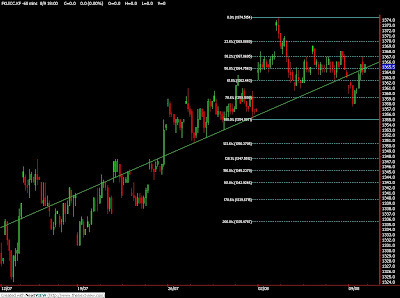 The contract dropped $1.45, or 1.8 percent, to end the session at $80.16 on Aug. 6. FCPO August Futures contract traded RM42 higher as compare to previous trading sessions to close at RM2661 with a total of 10,188 lots traded in the market. FCPO price continue to trade higher; following tightly on soybean oil electronic trading despite crude oil was traded lower before end of trading sessions. FCPO price continue to surge higher in attempt to test psychology resistance levels at RM2700 region during the trading sessions. Technically, FCPO price still seen riding on a bull rally provided support levels at RM2633 and RM2600 were not violated in the coming trading sessions while resistance seen at RM2722 and RM2750 regions. FKLI Aug Futures contract closed 3.5 points lower as compare to previous trading session to close at 1363 levels with a total of 2,516 lots traded in the market. FKLI was traded within range during entire trading sessions as regional indices and Dow Jones futures electronic trading were not traded on affirmative direction. 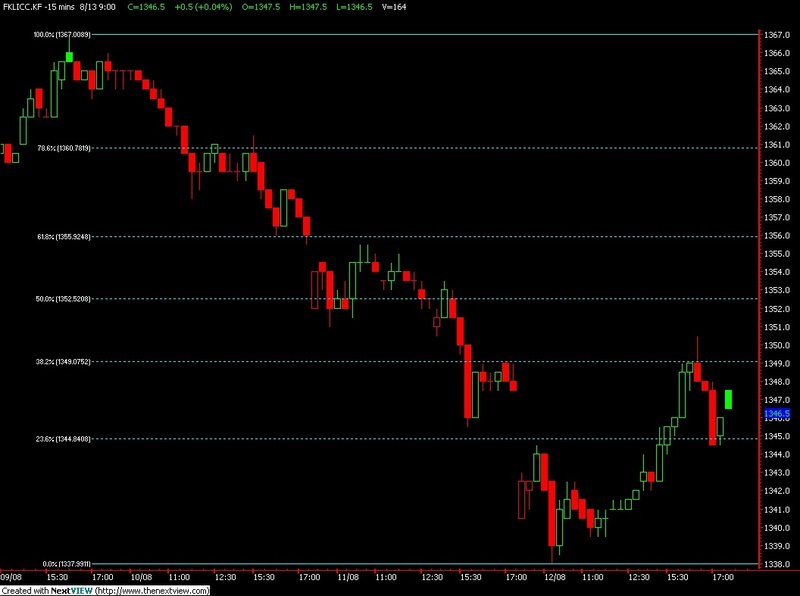 FKLI traded lower after reached resistance levels at 1368 regions before to test support levels at 1363 regions. 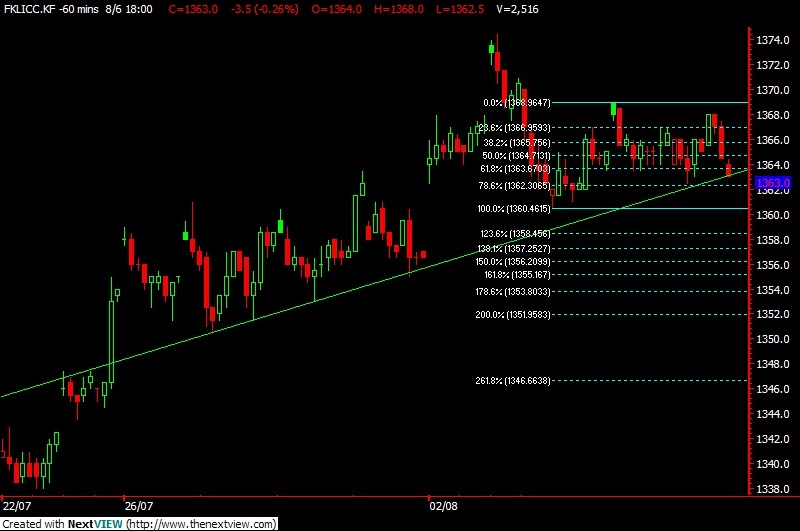 FKLI currently rested on above the support trend line at 1363 regions while 78.6% Fibonacci support levels seen at 1362 regions. Technically, FKLI would trigger further sell activity provided support levels at 1360.5 and 1355 were violated in the coming trading sessions. 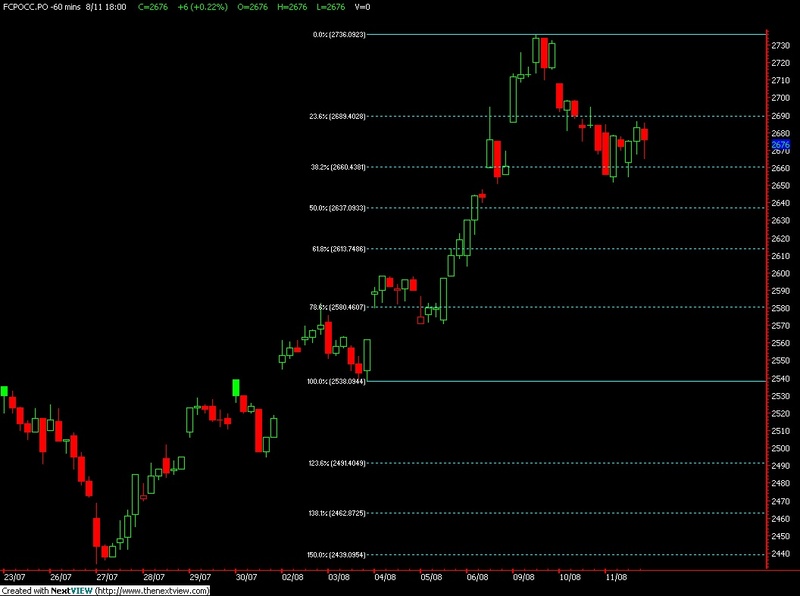 Else, FKLI would still consider riding on bullish market where nearest resistance levels seen at 1369 and 1379 regions.